French Emblems: Emblem: Quaere adolescens, utere senex. The young man should get, the old man should use. Ad Andream Ostervicum Splinteri filium. Iuvenem parare commonent, uti senem. One the one side, young and strong, busy with hard work, The young man; on the other the old, enjoying the fruits of the blessed Horn of Plenty, is filled with riches and joyful feasting; These figures remind the young man to lay up his riches, and the old to make use of them. Vicit Olympia, nunc senio confectus quiescit. The flower of youth ought not to be frittered away in debauchery or idleness, but steeped in the true ornaments of the spirit, be it in the study of literature and the liberal arts, by which at an early age one is guided towards mental cultivation, or be it in the mechanical, clerical or other artisanal arts: since just as with hard work virtue endures and grows bigger, even so with debauchery and decadent idleness it withers and drains away. By hard work (which holy scripture acknowledges in numerous places to be God’s work), young men both obtain the means for living, and lay up provision for a happy old age. Hard work is most fitting for the strength of youth, whilst the limbs [lit. knees] are vigorous: but leisurely freedom from work suits old age, and the enjoyment of one’s possessions. It is to this that those celebrated lines of the poet Ennius refer: [p.125] ‘Like a strong horse, who on the greatest race-course perhaps Won the Olympic games, now, having had his day, enjoys quiet old age’. It is right, therefore, what Porcius Latro the famous orator said: ‘The young man should earn, the old man should enjoy’; and what Seneca said, to the same effect: ‘It is for the young man to earn, and the old to enjoy’. On the one side a young man should be portrayed with his muscles unencumbered and his head bare, cutting the ground with a mattock; on the other side should be an old man, wrapped up in a thick animal-skin coat, reclining on a couch at a festive table laden with a sumptuous feast and drinking-bowls. 1. Andreas Ostervicus, son of Splinter, has not been identified. He is perhaps son of Splinter van Hargen (dedicatee in emblem XI, [FJUb011]), perhaps Lord of Oosterwijk. 2. For sedentarius, see the comment in Coustau, Pegma, Emblem 43 ([FCPb043]); it might refer to any work that requires to be done sitting down (e.g. 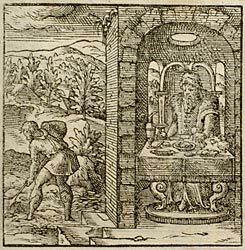 in Plautus, it is used on one occasion to refer to cobblers). Unlike Coustau, Junius is clearly using it in a good sense here. 3. Ennius, Annals 18.22-3 (quoted by Cicero, De Senectute (Cato Maior), 5.14). 4. Marcus Porcius Latro. A native of Hispania, teacher of Ovid, and friend of Seneca’s. Porcius is apparently a better reading than Portius.